This entry was posted in Batteries, Rambles, Uncategorized and tagged aa battery, kentli, li-ion, lipo, lithium ion, lithium polymer, rechargeable, regulator by ginbot86. Bookmark the permalink. Did you receive these batteries, finally? If so, have you had a chance to check them out? We’d be very interested to know this information. Unfortunately, no. I’ll have to talk to the seller and see if they can try resending the batteries. I have bought several kentli aaa, aa, 9 volt. Great batteries, I was most impressed by their low leak (when not in use). From what I can see, in the graph the dashed lines are the “Electronic cut-off voltage”. Meaning that the wireless microphone will no longer power on when the battery voltage reaches the line (about 1.22 volts). 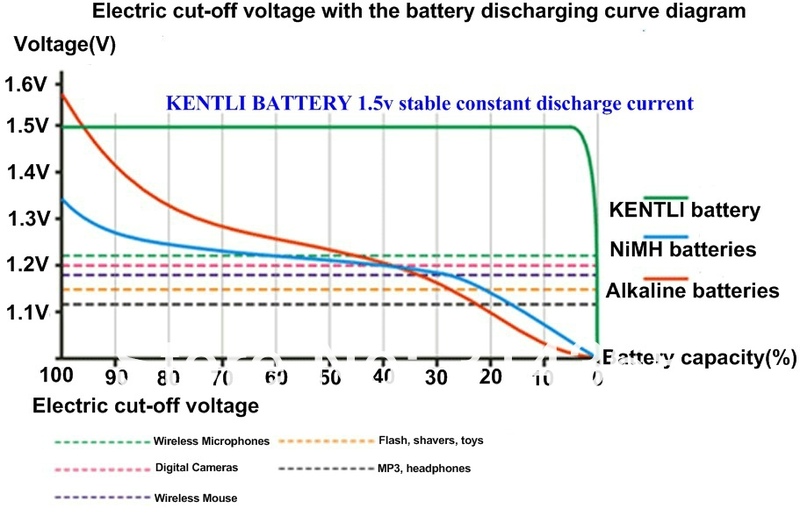 In the alkaline battery this would be at about 45% of the capacity and at about 60% for the NiMH.